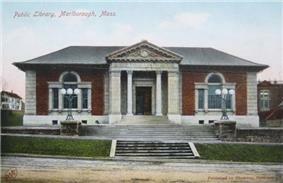 .History of the Town of Marlborough, Middlesex County, Massachusetts by Charles Hudson, and Joseph Allen. Published 1862, 544 pages. , Volume 1 (A-H)History of Middlesex County, Massachusetts, Volume 2 (L-W) compiled by Samuel Adams Drake, published 1879 and 1880. 572 and 505 pages. Marlborough Section in Volume 2 page 137 by R.A.Griffin and E.L.Bigelow. ^ "Office of the Mayor". 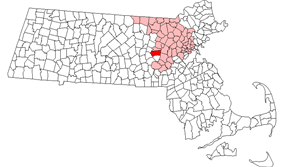 City of Marlborough, MA. Retrieved 17 September 2015. ^ Laidler, John (4 October 2012). "Mayors, other area notables take sides in Senate race". 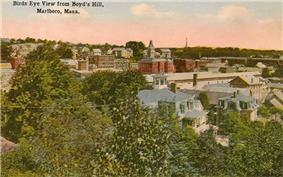 ^ "Marlborough Massachusetts History - Williams Tavern". History RootsWeb. Retrieved 2010-02-10. 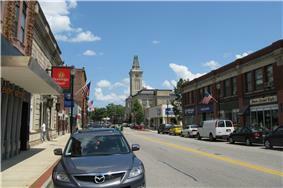 ^ "Marlborough's downtown recognized as a cultural district". Marlborough Economic Development Corporation. 2012-10-12. Retrieved 2014-06-16. ^ a b "City of Marlborough Official Website, Transportation". 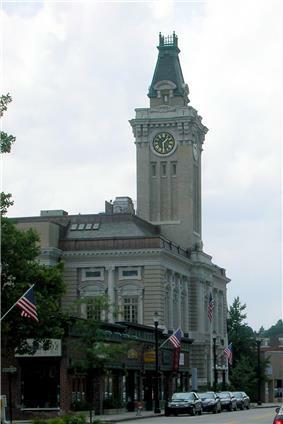 City of Marlborough. Retrieved 2012-01-12. ^ a b "MWRTA Route 7 Details". MWRTA. Retrieved 2012-01-12. ^ "MWRTA Route 7C Details". Retrieved 2012-01-12. ^ "Rates and Transfers Details". Retrieved 2012-01-12. ^ "City of Marlborough facebook". 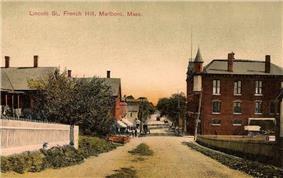 City of Marlborough. Retrieved 2015-10-05. Marlborough is located at (42.350909, -71.547530). According to the United States Census Bureau, the city has a total area of 22.2 square miles (57 km2), of which, 21.1 square miles (55 km2) of it is land and 1.1 square miles (2.8 km2) of it (4.87%) is water. Marlborough is drained by the Assabet River. 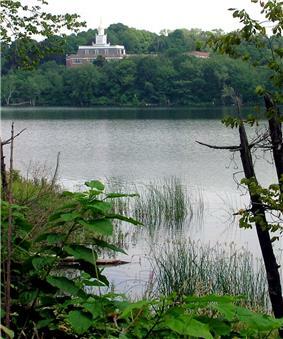 Within city limits are three large lakes, known as Lake Williams, Millham Reservoir and Fort Meadow Reservoir. A portion of Fort Meadow Reservoir extends into nearby Hudson. The construction of Interstates 495 and 290 and the Massachusetts Turnpike has enabled Marlborough to begin its fifth century on the cutting edge of a new industry: high technology and specialized electronics. Today, thousands flock here to work at TJX, Raytheon, Hewlett-Packard, AMD, Sun Microsystems, Navilyst Medical, Netezza, Boston Scientific, Sunovion (formerly Sepracor), 3Com, AT&T, Apple, Egenera, Evergreen Solar, The Butcher Corp (Butchers Bowling Alley Wax), Fidelity Investments, Quest Diagnostics, Lucent Technologies, and the many other (e.g., electronics, BIO Tech, Life Science, medical, cloud storage, and computer firms) that provide the strong business community in the city. Because of the city's central location with easy access to major highways and the pro-business, pro-development policies of the city government, the population of Marlborough has more than doubled in the last 25 years to over 38,000 at the time of the last census.